On Columbus day while the masses of people lucky enough to “celebrate” a holiday that marketing has yet to figure out how to make money on, I made my way to a cigar event that was a blast. 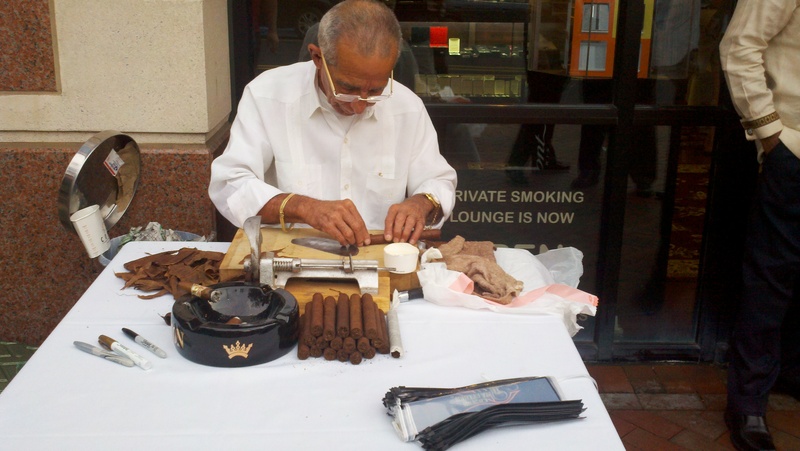 The Cigar Town shop in Reston’s Town Center was the event site and what a great store and evening it was. I was a bit early I guess so I purchased a Don Pepin “blue label” and settled into the private smoking lounge and watched ESPN. Soon the event kicked off and people flooded in! There was deals to be had with box discounts and free shirts, plus a freshly rolled cigar by Rene, Pepin’s personal master roller who is a treat to watch work. The crowd was quite lively and you could tell there were Pepin enthusiasts amongst the crowd. The boxes of Pepin cigars were quickly disappearing to men with big grins on their faces who hadn’t yet realized they’d dropped a few hundred dollars. But when you like Premium Cigars, that is just the cost! 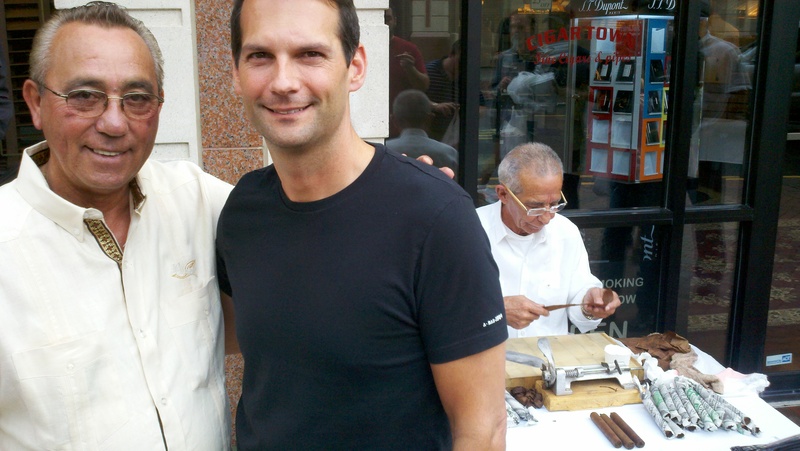 Pepin graciously signed each person’s box purchase, posed for pictures and shared some knowledge with those who were interested in the whole cigar industry and more specifically what it takes to make a premium cigar. Although my spanish is poor at best, he is just a very genuine gentleman and does not have any hint of celebrity or arrogance to him. This is a guy you would want to hang out with! So I too couldn’t resist the discount, free Pepin shirt and freshly rolled cigar by Rene and walked out with a box of my Pepin favorites that I refer to as “Blue Label” because that is the color of the band. I’m sophisticated like that. I met some really interesting people there, compared cigar likes with a few and genuinely enjoyed myself. Of course, no great event is complete without a beautiful young lady, so this event was no exception! I joked with her that only a place like this would an old man distract a crowd of men away from her! So if you haven’t tried Don Pepin Garcia cigars you are missing out. The My Father line is highly revered and the man simply knows how to blend tobacco leafs! He has only been out of Cuba’s factories for about eleven years and is making waves all over the industry. Do yourself a favor and pick one up today. Not that I'm happy or anything.